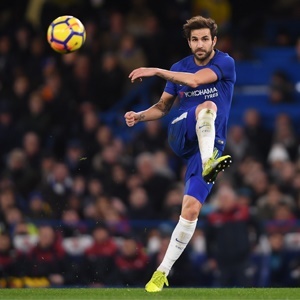 London - Cesc Fabregas has promised Chelsea will be dogged in their ongoing pursuit of Manchester City despite admitting Pep Guardiola's side appear on course for the Premier League title. Chelsea moved to back to within 11 points of the league leaders after labouring to a 1-0 win over struggling Swansea City and will attempt to close the gap when they face Newcastle United at Stamford Bridge this weekend. The Blues' midweek victory came 24 hours after Guardiola's team had needed an added-time winner to beat Southampton to extend their winning run. Chelsea midfielder Fabregas admitted the nature of City's triumph suggested they could be the team to succeed the west Londoners as champions. "Obviously when you're in the kind of form Manchester City are in, that whatever you do, you score one, two, three, four late winners, sometimes this shows you it could be your year," said the Spain international. "That you are so lucky in the final minutes. It happened to us when I first came to the club a few years ago and we were winning games at the end. That shows that it's your year and everything is happening for you." Fabregas added: "But at the same time this is not happening in March, it is late November so it's still early (in the season). "Let's see what happens. They are doing well but we have to keep an eye on the top and get closer and closer. "We wish that they will drop points and you keep them in mind. Obviously they are at the top and we want to be at the top. We have to keep doing what we are doing, winning and winning." City's progress is relentless at the moment but Fabregas says Antonio Conte's side will not be daunted by their rival's run of positive results. "We have the mentality to handle it," Fabregas insisted. "We have to keep going and not think about what they are doing. We know they are doing well. Let's just try to put this to the side and get as close as we can." Conte betrayed signs of frustration during the Swansea game when he was sent to the stands after clashing with match officials and the Chelsea manager has been charged with misconduct by the Football Association. The Italian's reaction perhaps reflected the pressure on Chelsea to capitalise on a run of eight games against sides in the bottom half of the division. Eden Hazard and Cesar Azpilicueta are expected to return after being rested midweek. Rafa Benitez returns to Chelsea for the first time since leading the club to the Europa League title in 2013, as the Spaniard's Newcastle side look to improve on a run of just one victory in 22 Premier League visits to Stamford Bridge. Benitez will again be without the injured trio of Jamaal Lascelles, Christian Atsu and Paul Dummett in a bid to stem a five-game winless run which has left Newcastle in 12th place, five points above the relegation zone and with only a single win since mid-September. The northeast side's players have come in for criticism after taking one point from the last possible 15 on their barren run, and Ayoze Perez said: "There are always going to be people who think you're not good enough." The Spanish forward has found the net just once in 13 appearances this season, and the 24-year-old added: "We don't need someone else to tell us when we've made a mistake. "People are free to have their opinion, and as professionals we have to deal with the criticism, concentrate on our jobs and keep trying to do our best."